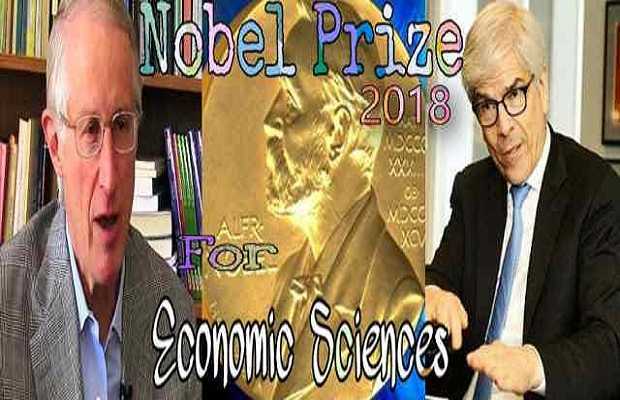 The 2018 Nobel Prize in Economic Sciences was awarded on Monday to a pair of American economists, William D. Nordhaus from Yale University, US, and Paul M. Romer from New York University, US, for their work highlighting the importance of government policy in fostering sustainable economic growth. Mr, William won this prize for “integrating climate change into long-run macroeconomic analysis”. And Mr. Romer won this award for integrating technological innovations into the long-run macroeconomic analysis in a market economy”. Economists had traditionally treated the arrival of new ideas as manna from heaven: obviously important but beyond the control of public policy. The announcement of the award came on the same day that a United Nations panel on climate change released a report warning of dire consequences from climate change and urging governments to respond to the problem with greater urgency. Goran K. Hansson, secretary general of the Royal Swedish Academy of Sciences said at a news conference following the announcement. One problem today is that people think environmental protection will be so expensive and difficult that they want to ignore the problem and pretend it does not exist. Humans are capable of gaining amazing achievements if we put our minds into it. The message is that it is needed for countries to cooperate globally to solve some of these big problems. Mr. Nordhaus studied economic growth and natural resources at the beginning of 1970. He graduated from Yale and then earned a doctorate in economics from the Massachusetts Institute of Technology. That same year, he returned to Yale as a member of the economics faculty, and he has remained there ever since. He became an early advocate for the taxation of carbon emissions. He developed the integrated assessment model and created the DICE (Dynamic Integrated Climate-Economy) and RICE (Regional dynamic Integrated Climate-Economy) models to determine efficient paths for coping with climate change. These models were the foundation for integrated assessment models used by the Intergovernmental Panel on Climate Change to investigate how fossil fuels burnt for economic use give off carbon emissions that raise atmospheric concentrations of carbon and boost global temperatures, in turn causing economic harm. Mr. Romer is the son of Roy Romer, a former governor of Colorado. He earned a doctorate in economics from the University of Chicago in 1983 and then began his career as an academic. Mr. Romer sought to explain the role of technological advances in driving economic growth. His work was inspired by a desire to understand the remarkable acceleration in growth that began with the Industrial Revolution. He argued that national differences in such public policies helped to explain differences in economic growth rates. In particular, Mr. Romer’s work elucidated the value of participating in larger communities. While a given part of the world might be able to meet its own material needs, larger communities tend to produce more ideas, which can then be broadly shared. Mr. Romer’s big idea was to argue that policymakers could foster technological innovation, for example, by investing in research and development and by writing patent laws that provided sufficient rewards for new ideas without letting inventors permanently monopolize those rewards.